In 2006 Sue traveled to Brazil with the family to experience the healing energy provided at the Casa. The Crystals and light frequencies, help purify energy of the body, working on the chakras and balancing and cleansing the bodies energy fields. It is then possible to feel the meridians flowing better, emotions and blocked energy can clear, and the whole body feels completely rested and rejuvenated. What is Crystal Bed Healing? The Crystal Bed is a healing device that has been developed in Brazil, for the world-renowned healing centre the “Casa de Dom Inacio”. The bed has 7 extremely clear and highly polished quartz crystals suspended approx 30cm above the client lying on a massage table. 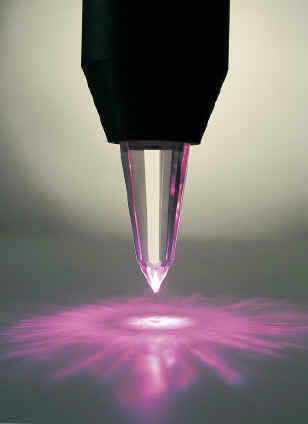 Each of the quarts crystals has been cut to a specific frequency. Each crystal is aligned above one of the seven human energy centers or chakras. Coloured lights, chosen to match the chakra colours, radiate light and energy through the crystals to each respective chakra, and shine on and off in certain rhythms to cleanse, balance, and align your energies. The individual receiving the session rests face up with eyes closed, bathing in the energy. How does the “Crystal Bed” produce Healing? 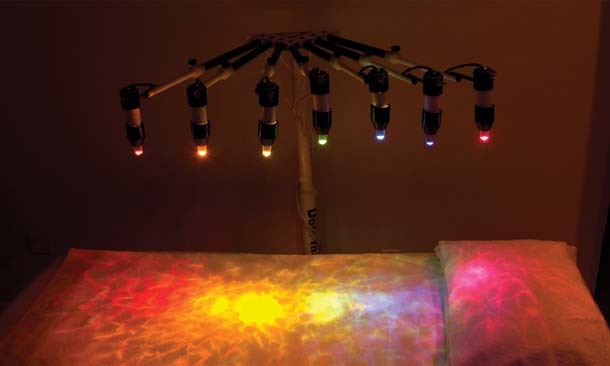 The “Crystal Bed” combines the power of Color Therapy and Crystal Healing Therapy. This energy stream produces beneficial stimulation on many physical and energetic levels of being. The coloured light shining through the crystals is a tool that the healing spirits use to channel their healing energy into the individual receiving the “Crystal Bed Healing”. As the color is transmitted through the crystal onto the corresponding chakra, the chakra is cleansed, energized, and balanced with all of the other chakras. This allows the other aspects of our self, whether it be mental, emotional or physical to be brought into balance. People feel all manner of sensations during and after sessions – pressure, weight, lightness, heaviness, hot, cold, wind, tickling, tingling etc. The crystals can evoke feelings of peace and serenity, and typically a very deep relaxation. You may simply fall asleep and wake up feeling very refreshed and renewed. What to expect after “Crystal Bed Healing” Session? As with many of Subtle Energy Healing Therapies, no claims can be made that any disease states can be cured. However there are many, many reports of healings occurring. Healing can occur on many different levels, spiritual, mental, emotional, and physical. How often should “Crystal Bed Healing” be had? The number of sessions someone has depends on the individuals’ level of health, and their reason for having “Crystal Bed Healing” Sessions. If someone is very ill, then sessions can be as many as two to three per week until their level of health increases, then reducing the frequency to weekly and then to monthly. If an individual is having Crystal Bed Healing Sessions for a spiritual reason then one or two sessions weekly are adequate. Still others prefer to come when they feel the need, and others come once a month as preventive or to help them stay “tuned”. (Chronic Fatigue) Lesley, Sydney – “The crystal bed is great for my CFS, I kind of pass out when I go on it and when I get off, I am fully recharged, I have had 5 sessions and I would say I am already 50% better”.